Looking for a safe, traffic-free location for a spot of walking or cycling? Want to get away from the hustle and bustle of everyday life? Why not pay a visit to your local Lonydd Glas (Recreational Routes) network? Designed especially for walking and cycling, there are over 50.5 kilometres (31.5 miles) of these purpose-built paths in Gwynedd, where you can relax amid nature and forget about the outside world. Established along disused railway lines, these are quiet rural paths that lazily meander into the picturesque Gwynedd countryside; a region that is unique as regards to its landscape, its culture and people, and is also a stronghold for the Welsh language. 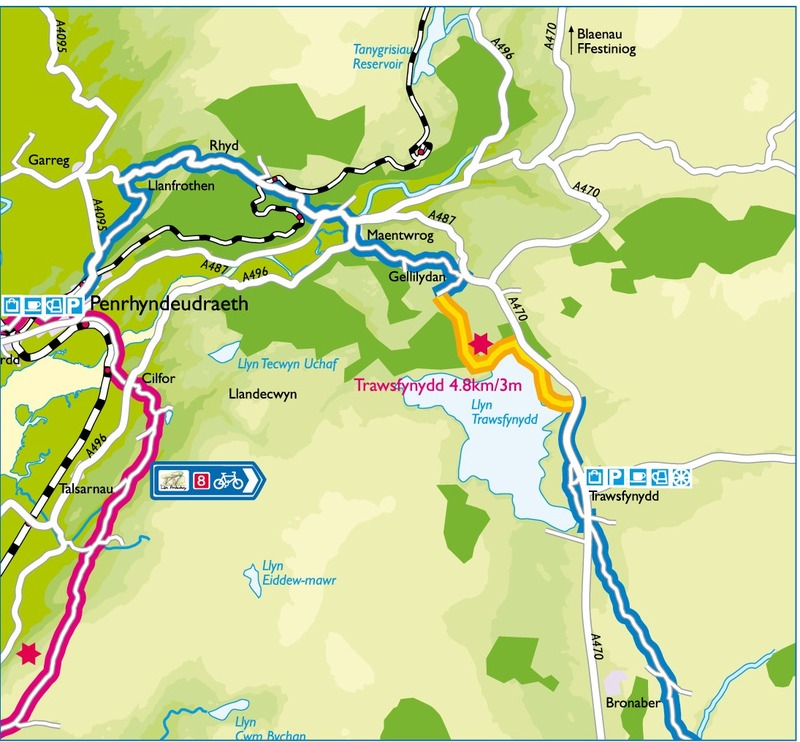 This network is based on paths that are used by permission of Gwynedd Council and the Snowdonia National Peak Authority. The Lonydd Glas are there for your enjoyment, therefore your respect and good behaviour is sought at all times. To walk this path south from Porth Penrhyn is like walking hand in hand with the River Cegin. This part of the route which runs between Porth Penrhyn and the village of Glasinfryn, was developed in the 1980’s and is also known as Lôn Bach. The disused narrow gauge railway upon which the path was built, was constructed by the Penrhyn Estate to transport slate from the quarries at Bethesda for export at Porth Penrhyn. 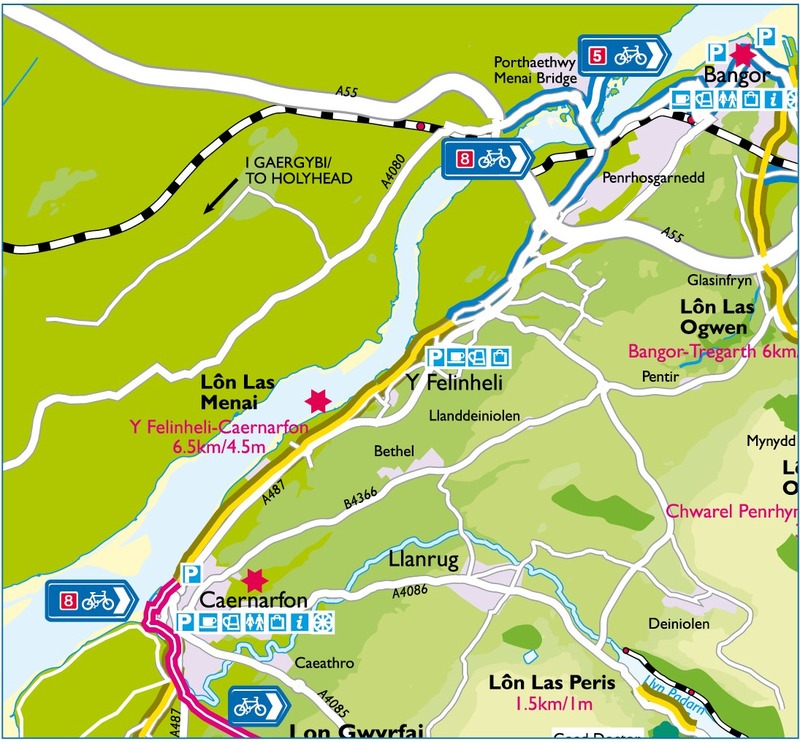 By today, Lôn Bach is part of Lôn Las Ogwen which continues south on its journey, stretching lazily over the viaduct at Glasinfryn to Tregarth, and past Penrhyn Quarry into the Ffrancon Valley. From the popular village of Llanberis, Lôn Las Peris meanders lazily along the sheltered shore of Llyn Padarn. Shortly after the tunnel, the path connects onto the public road network from where you can walk or cycle through the villages of Cwm y Glo and Llanrug, and follow the Seiont River valley towards the busy town of Caernarfon. Alternatively, why not further explore the historic countryside of this slate valley known as the gateway to Snowdonia, by following country lanes to Deiniolen or Penisarwaun, or by cycling up the valley towards Nant Peris? 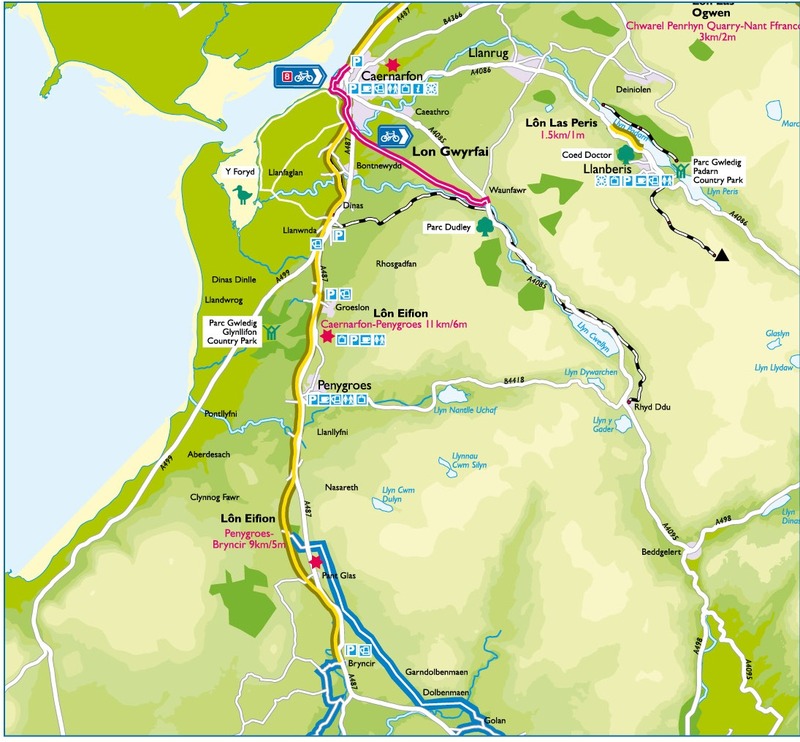 Lôn Gwyrfai is a cycling and walking route linking Caernarfon to Waunfawr. The journey starts on Pont Seiont, Caernarfon towards Glanrafon House and along lanes and tracks that date to the time of the Romans until you reach the village of Waunfawr. Some people might say that Lôn Eifion is the most well known and well used cycle route on the network. Certainly it is worth a visit, if only to feast your eyes on the breathtaking views. Indulge yourself in the blues and greens of the Llŷn Peninsula to the south west, Caernarfon Bay and Anglesey to the west and north, and the impressive mountains of Snowdonia to the east. Lôn Eifion is a green avenue of native trees and plants which stretches between the busy historical town of Caernarfon and the rural village of Bryncir to the south. 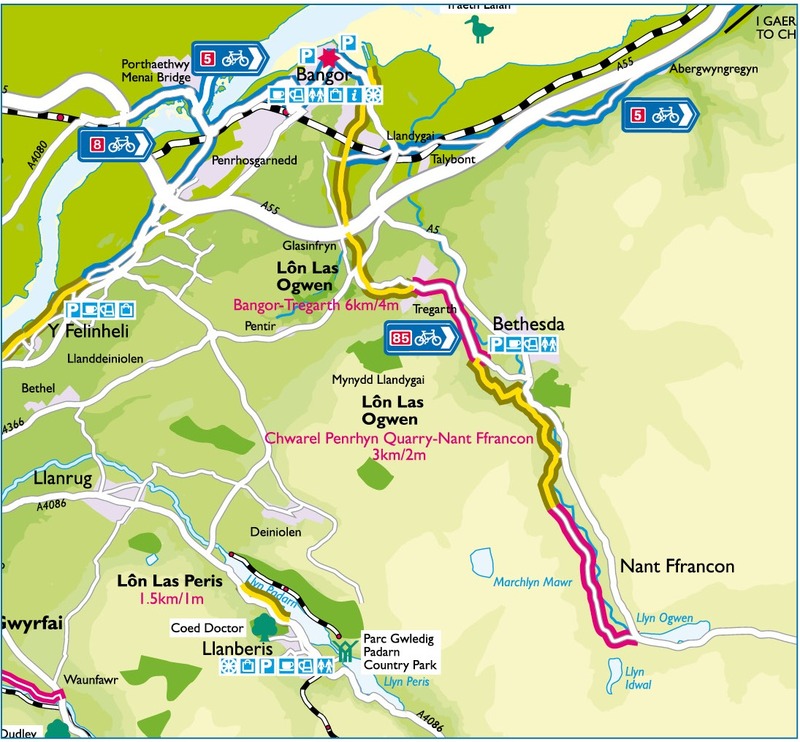 The entire length of Lôn Eifion has a tarmaced surface and is part of Lôn Las Cymru, route number 8 on the National Cycle Network. The path follows the eastern shore of Trawsfynydd Lake through woodlands and open country. Much of the path was built on land owned by the Trawsfynydd Nuclear Power Station, which is currently being decommissioned. Be aware that in the vicinity of the power station and its visitor centre, the route crosses roads used by vehicles. A cycle path provides a link along the A470 to Trawsfynydd village. Winding lazily along a disused railway track, the Mawddach Trail which is owned and managed by the Snowdonia National Park Authority, follows the Mawddach estuary from Barmouth to Dolgellau. The path, having been surfaced using compacted dust, has further been developed between Penmaenpool and Dolgellau to cater for disabled users. Awe inspiring views can be seen whilst walking and cycling the path, especially of the estuary and the spectacular Barmouth bridge. Also, hidden along the path verges and outlying land are species rich habitats such as wetland and forestry, for example Coedydd Abergwynant, a woodland adjacent to the path which is owned by the Authority. 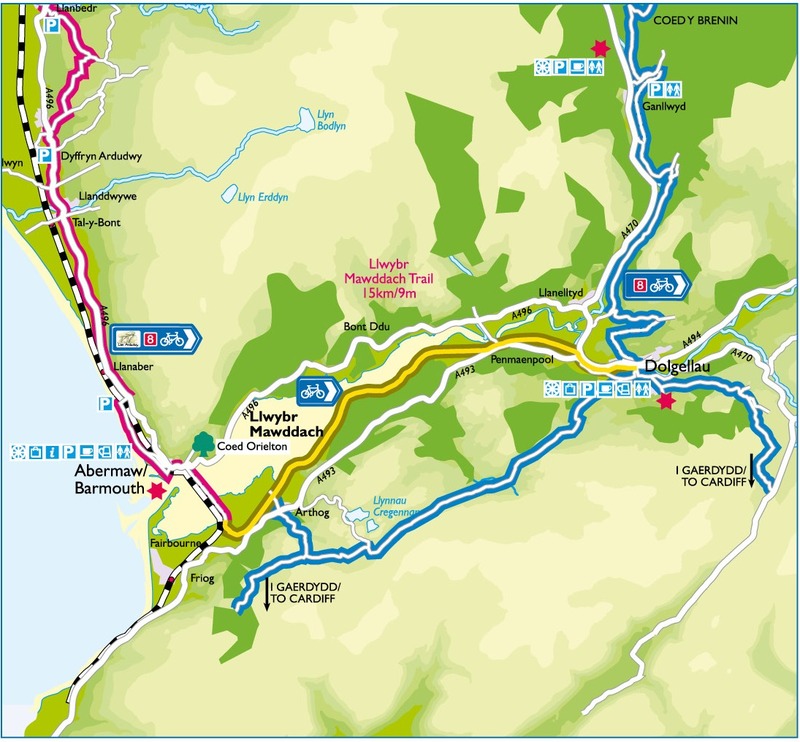 The Mawddach Trail is part of Lôn Las Cymru, route number 8 on the National Cycle Network.